Sleep! The majority of the people I speak to have issues with their sleep. Can’t get to sleep. Don’t sleep enough. Bad quality sleep. Getting up in the middle of the night. Racing mind when going to sleep. Waking up tied. The list goes on and on. 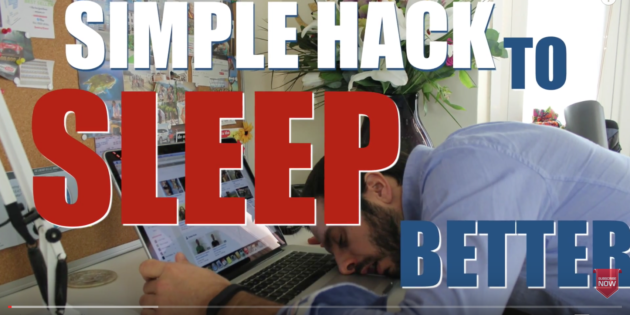 And while the issue of sleep is a bigger topic (and one I cover more fully in my course Sleep Soundly – http://thethoughtgym.com/sleepsoundly ) here’s one simple hack that I use daily to get me to sleep. No what? No screens, phone, tablets, laptops, internet, even TV and clocks, after 9pm at night. When it comes to 9pm, think of it like a hard cut off for these devices. And do what? Read, talk, get your bag ready for the next day, plan your day out in your notebook, take a bath, clean the dishes, meditate, tidy the house…. Lots of things can happen in the time from 9pm till you go to bed. And I’m assuming a “bed time” between 10pm – 11pm here. Of course if you go to bed later, then it might be 10pm cut off for you. But “Nein, after ten” doesn’t have the same ring to it. Plus there are many reasons (sleep related) that you should get as many of the 10pm – 2am hours in as possibly. It’s when the body does a lot of repair and decompressing. Far better, generally, to have 8 hrs sleep from 10pm – 6am, than 2am – 10am. Of course everyone is a little different, but the body’s circadian rhythm is set up for light/dark patterns. Patterns we’ve shifted because of artificial light, and now a 24/7 culture in most of the world. When you are on your phone, laptop or other light emitting device you are exposed to two things that affect your sleep. the blue light from the devices. Light emits a wavelength of light, but while we need blue light expose in the morning/day, by the evening, this will suppress our manufacture of melatonin. An important hormone for sleep but also one of the major cancer fighting hormones too. The stimulus from the devices that you are using. You can somewhat mitigate against the blue light from the devices by using things like flux on the laptop and then twilight on the phone (see my blog here for details on those), and even blue light blocking eyeglasses (see blog here) I do both things. From about 8pm usually. Although f.lux and twilight are automatically set. I put the glasses on just after it gets dark. In fact I find that if I don’t I start to feel a subtle strain in my eyes and head. Even with all that in place, you brain is still being stimulated by the inputs. This will negatively affect your ability to get to sleep later. I test this from time to time and it does affect me. Sometimes I will watch a TV show before bed – although I still allow a good 30 minutes to wind down usually – and it does affect how quick I fall asleep. And if my head it occupied with things. Even worse, on a rare occasion I’m working late – the other night I got hooked on editing a showreel of mine (here if interested) and I kept working till probably 1am. Earlier I said no phones and clocks. That means also putting the phone into airplane mode at 9pm, or better still, turning off completely. I usually have it on airplane mode as I might use the music to relax later in the evening or with a bath (tip: you can still put phone to bluetooth for your speakers if required while in airplane mode). And no clocks? Yes. I said that I probably went to bed at 1am the other night. Truth is I don’t know for sure as even when working on a laptop I’ve trained myself to not look at the clock. I don’t have clocks in my house but use my watch on the side which I turn away from me after 9pm. Why? Think about it. What’s typically the last thing people do before going to bed (or while in bed). Check the time. And then realise they (more often than not) have to get up in X amount of hours. This causes undue stress usually as it’s never as much time as they’d want in bed. This means that my phone typically (unless extenuating circumstances) will stay on airplane mode until 9am or later. I won’t check the internet, email or anything until after 9am. If I listen to a podcast while making breakfast, I will just have the internet on maybe and not the data, so I don’t get messages. That’s not always the case, but more often than not. This allows me to win the morning, and as a result the day often. It gives me a good few hours (as I normally get up around 6am) to get other things done important to me. Then I’m ready to start the day once I’ve set myself up on my agenda. Not other people’s.